Years of work at the kiwicelts website has led to the development of a comprehensive mapping system for New Zealand. Called the GENEALOGY PLACEMAP (GeneaMap), it provides a comprehensive map for New Zealand. 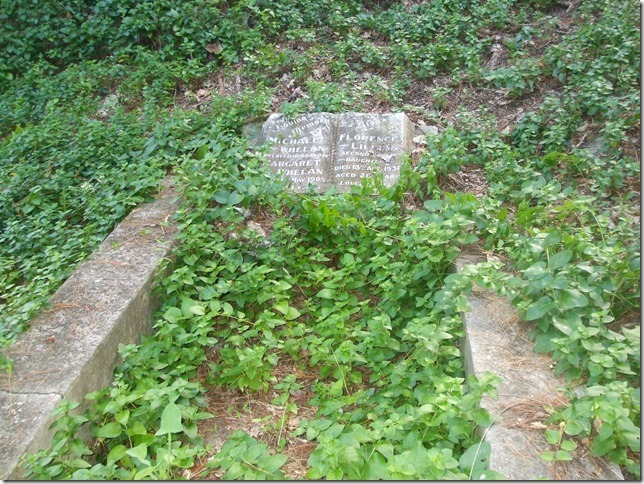 Initially used to identify cemeteries throughout New Zealand - it is a quick way to find out more about a cemetery and how to access available records. The GeneaMap now has landmarked key historical sites such as schools, war memorials and museums. Below is the map that came up when I entered THAMES in the search box. The street view facility also exists as with other mapping systems. The other important mapping site to be used, that is specific to the Thames-Coromandel area is via the TCDC (Thames Coromandel District Council) online mapping facility. As well as general map modules it allows the researcher to search for cemetery details at any of the TCDC cemeteries. Have you got a grand or great grandparent who was a nurse in World War One? If they trained or worked in the Thames area, I am on the lookout for any information, such as copies of letters, photos or other memorabilia. A list of names found to date can be seen here. 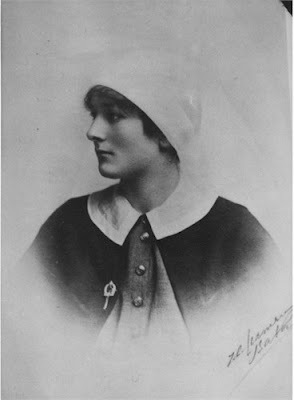 One nurse who trained at Thames Hospital School of Nursing and went on to serve in World War One, was S/N Annette Delugar. Delugar had graduated in 1916 and enlisted 6th October 1917. The daughter of John and Eleanor Delugar who was born 21st October 1891 in Paraguay. Just noticed a different view of the school, which may be of interest. Previous information on the school can be found here. The photo above is from Upper Albert Street, looking down on Waiokaraka flat and the Waiokaraka School (later known as Central School). Up in the centre can be seen the Sandes Street School, located on the corner of Richmond and Sandes Street, Shortland in Thames. As the enlargement below shows, this was a school of considerable size. The character of Thames, will next week continue to be changed forever. The gold town renown for the number of hotels, that were distributed from Tararu, through Grahamstown to Shortland and onto Parawai. Yet another is to close it's doors - leaving only the Junction and Imperial Hotels. The Salutation Hotel on the corner of Mary & Mackay Streets will cease trading in the near future. The hotel had been operating on the present site since at least 1870, when Alex MILL was the publican. Then in a different script: Johnstone family owned Hotel 1912-1926, Grand-daughter Jill Pritchard Goldie used to sketch on Hotel steps. The Lamb connection is to Lamb Bros, Timber Merchants at the corner of Mary and Queen Streets, Thames. The company involved with the rebuilding of the hotel. On 4th August 1937, (Photo states 3rd) the hotel caught fire and one man lost his life. He was Mr ALBERT FISHER, a miner. Later in December that year, it was announced that there were plans for a modern Hotel. How the weeks fly by, and progress continues on the archives building. The roof is on and will soon be fully enclosed. (Two openings remain for the large glass panel windows) A sneak preview inside showed how the space will be utilised with storage, work and archive rooms. A credit to the TCHT and the tradesmen who have been involved to-date. PS. 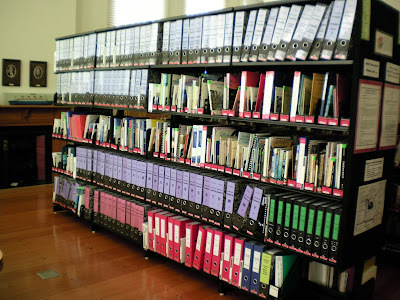 If you haven't called into The Treasury lately, the shelves continue to bulge with information and a growing number of the resources are indexed. This makes researching easier and allows you to make a preliminary assessment online, of what may be held for your research interest. On the Tauranga Kete site is the above story by Meghan, a regular correspondent for the 'Peninsula Press' in Thames and author of books featuring tales of Thames. "The day you marry, the day you die, the day you marry, the day you die,” sang the train wheels to John Lennox as the Thames train steamed and whistled its way to Paeroa in August 1902. Short, but well-built, the dapper young man sported cropped haircut, a dark moustache that gave him an almost foreign appearance, readymade but well fitting dark clothes, neat India-rubber shoes and straw hat. He also wore a white stand-up collar and black tie." Click here to find the rest of the tale and how MICHAEL WHELAN was involved in the events of 1902. In Loving Memory of Michael Whelan beloved husband of Margaret K. Whelan died 17th May 1905 aged 29 years also Florence Lillian second loved daughter died 13th August 1930 aged 26 years "Loved by all"
If your Parents/Grandparents had 495 Pounds in 1930, they may well have purchased a HUDSON Great 8 from Gordon MINCHER of Thames. There were few cars in Thames over these years, most relying on the train for transport or perhaps using a service car for out of town trips. 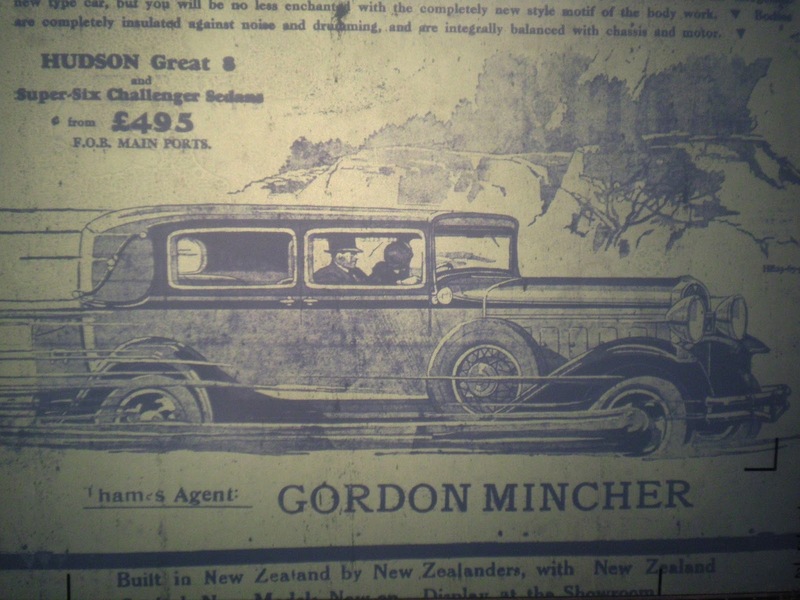 Gordon MINCHER had a service station, located on the eastern side of Pollen Street (Willoughby to Grey Streets section). 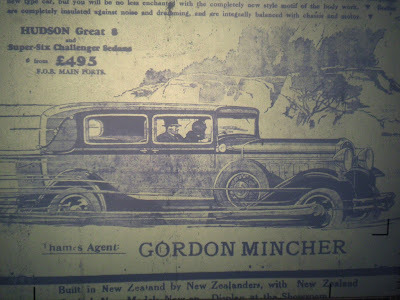 The business operated from c1920s to post 1940s. It's a beautiful winters day in Thames and the archives site is a hive of activity. 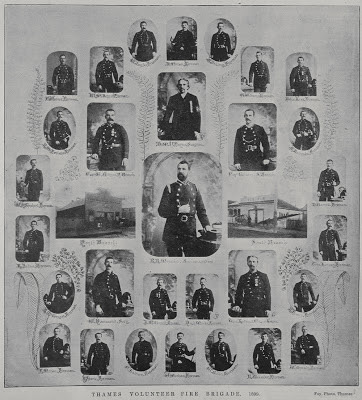 From the early days of settlement on the goldfields, the need for an efficient fire service was necessary. Wooden buildings and shanties were hastily erected, in close proximity to one another. Fires destroyed many buildings, especially hotels! The Shortland and Grahamstown Fire Brigades were established - the forerunners of the Thames Volunteer Fire Brigade that exists today. 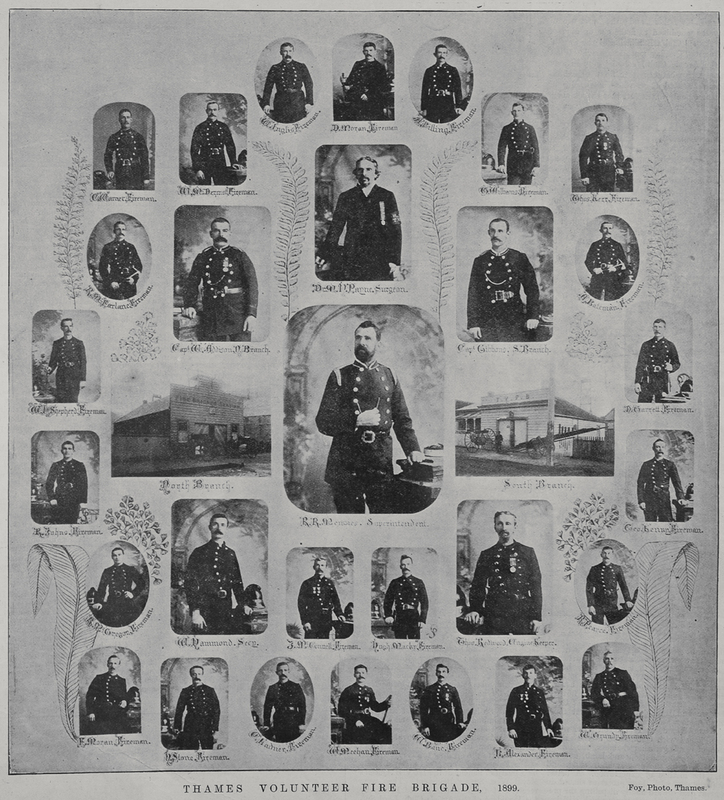 A full history is on the website of The Thames Volunteer Fire Brigade, along with a list of known Firemen. 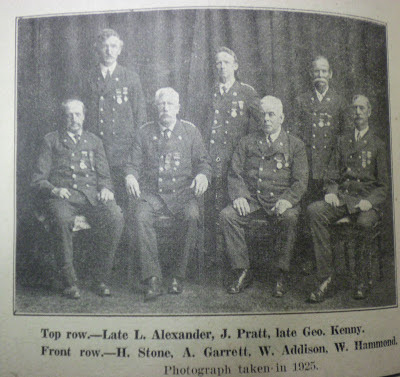 In the Thames Star 5/11/1943 a photo was republished of a group of 1925 Firemen from Thames. 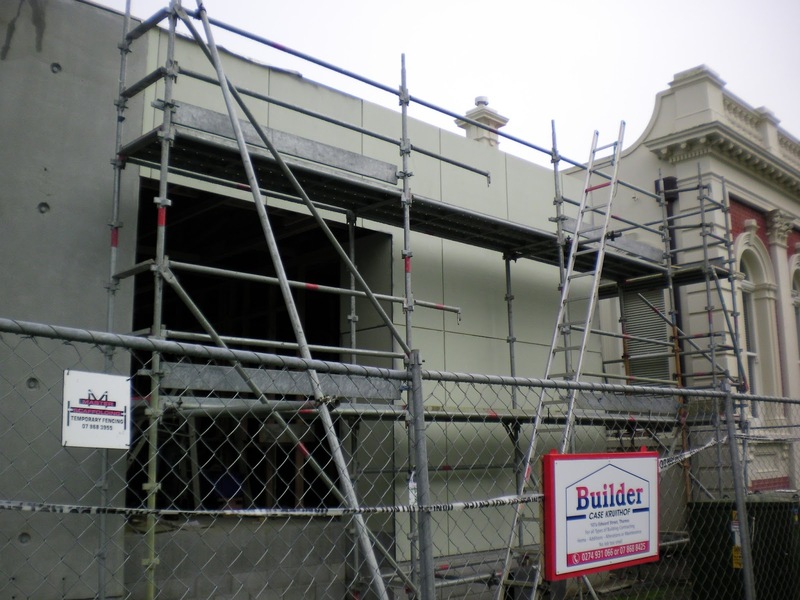 Work is steadily continuing on the Archives building adjacent to The Treasury, Queen Street, Thames. Full scaffolding now surrounds the northern end of the building.